Nic held out his hand for the scrub brush so that he could take over. As I rounded the corner I could hear Emma singing. “Hi Em. What are you doing?” I asked surveying the scene. “Mommy go away!” Emma said. This is what Emma says when she thinks she may be doing something we might object to. “Em! You’re giving your dolls a bath!” I said. “Mommy go away, go away!” Emma said while trying to close the bathroom door with her foot. “Yes,” Emma said and closed the door on me. “What’s she doing, Mom?” Nic asked me when I reappeared. “Doing great job washing doll’s hair,” Emma said, nodding her head and reaching for the bottle of shampoo. “Yeah, you’re doing a great job!” Nic said. As Nic said this, Emma squirted an enormous amount of shampoo onto each of her doll’s heads. “Okay, maybe that’s too much,” Nic commented, looking at me with concern. 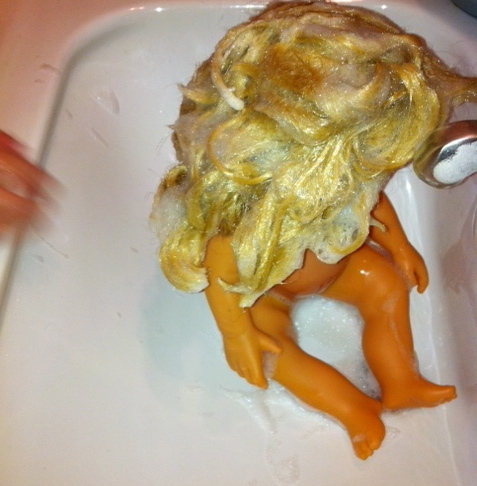 Oblivious, Emma happily massaged the shampoo into each of her doll’s hair and then pulled one of them from the tub and sat her in the sink. “Have to rinse hair,” she announced as water sprayed from the sink faucet out into the bathroom onto her and her brother. “Uh-oh!” Emma said, cheerfully as she struggled out of her now soaked nightgown. “Oh boy,” Nic said, retreating from the spray. Emma carefully gathered all the rubber ducks from the bathtub and sat them on the edge of the sink, then rinsed each of her dolls before putting them on a towel on the floor. 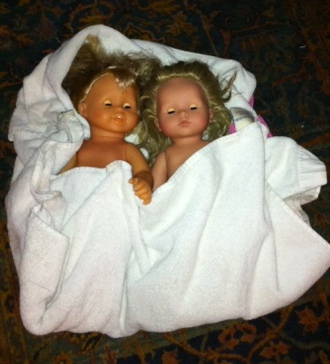 “Dolls all done!” Emma said, as she wrapped her dolls in several towels. “Awesome job drying off dolls!” Emma said. “Now time for bed,” she added. I often find myself looking for little clues, the small details in what Emma does as reasons for hope. The washing of her dolls is such a great example, I think, of Emma’s continued development. That she thought to include the rubber ducks was such a wonderful display of thoughtfulness and pretend play. Emma still doesn’t cuddle her dolls the way I used to when I was a little girl, but in her own way she is caring for them, giving them a bath, washing their hair, rinsing them off and then drying them, wrapping them in towels before leaving them on the floor. She has, in the past, put them in bed as well, though she seemed to lose interest before that thought occurred to her. Emma even remembered to drain the water from the tub before shutting off the light and leaving the bathroom. Sometimes I think I am clutching at straws, I mean, really what’s the big deal? So she gave her dolls a bath. But to me, it is a big deal. Or I choose to make it one, because really what’s the alternative? I can find the positive in the things she does, see them as hopeful examples of progress or I can shrug my shoulders and say – So what? I’ve never been the “so what?” type, so I can’t imagine I’ll start now. 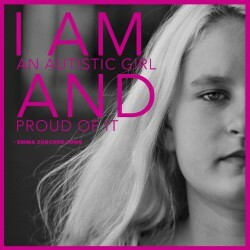 For more on Emma’s journey through a childhood of autism go to: EmmasHopeBook. This entry was posted in Autism, Parenting, Pretend Play and tagged Autism, autism children, autistic, autistic children, living with autism, Parenting, Pretend Play. Bookmark the permalink.